Definition at line 141 of file CollapsedForwarding.cc. Definition at line 145 of file CollapsedForwarding.cc. Definition at line 171 of file CollapsedForwarding.cc. Definition at line 158 of file CollapsedForwarding.cc. References Config, Ipc::MultiQueue::Init(), Must, QueueCapacity, ShmLabel, and SquidConfig::workers. Definition at line 166 of file CollapsedForwarding.cc. Reimplemented in MemStoreRr, SharedSessionCacheRr, TransientsRr, and SharedMemPagesRr. Definition at line 376 of file Segment.cc. 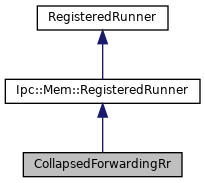 References Ipc::Mem::Segment::create(), IamMasterProcess(), IamWorkerProcess(), InDaemonMode(), and Ipc::Mem::Segment::open(). Referenced by testRock::setUp(), SharedMemPagesRr::useConfig(), TransientsRr::useConfig(), SharedSessionCacheRr::useConfig(), and MemStoreRr::useConfig(). Definition at line 153 of file CollapsedForwarding.cc.